The 1980s was a tempestuous decade of global political shifts: the fall of the Berlin Wall in 1989; along with the demise of Communism; a soaring stock market until the Crash of 1987; and the rise of U.S. right-wing conservatism under President Reagan. Moreover extensive technological advancement led to Cable Television, with its multiple channels, MTV and CNN allowing viewers greater viewing options, along with late night television and personal computers all contributed to altered visual viewing and the way we received information. [i] The change in the art canon shifted in the 1970s toward Post-modernism inspired by the rapid spread of Critical and Revisionist Theory. Additionally the AIDS crisis surfaced in the 80s, the rise of multiculturalism, Feminism theory and the intensive product branding demonstrated by Nike and Calvin Klein advertising on cable TV. This snap shot of a decade is noteworthy when viewing the Hirshhorn Museum’s exhibition Brand New: Art and Commodity in the 1980s. Over the past several years there has been a rekindled interest in the art of the 1980s [ii], including shows at the Chicago’s MOCA, This Will Have Been: Art, Love and Politics in the 1980s, MOMA’s Contemporary Galleries: 1980–Now, Club 57: Film, Performance, and Art in the East Village, 1978–1983 (currently on view) and the Whitney’s Fast Forward: Painting from the 1980s. 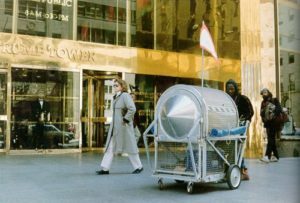 The Hirshhorn’s exhibition Brand New: Art and Commodity in the 1980s is yet another version exploring the art from this decade. 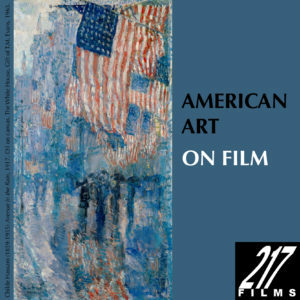 Media culture of movies and television, popular music, advertising, and ubiquitous critical theory, especially the writings of Roland Barthes, Michel Foucault, Julia Kristeva, influenced many of the artists’ cool attitudes toward material culture in the United States. 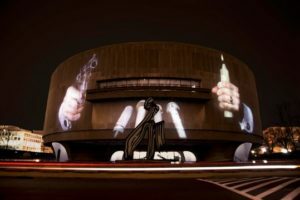 Organized by the Hirshhorn’s curator at large, Gianni Jetzer filters this thematic display through the lens of branding, commodity and artists as products. Arranged chronologically and featuring approximately 150 works by 68 artists, mostly from the New York area, the exhibition comes off as a type of scruffy ‘Whitman Sampler’ featuring many blue-chip artists of today’s art market, including Richard Prince, Jean-Michel Basquiat, Barbara Kruger, Cindy Sherman, Jeff Koons and, of course, the father of all commodity/branding, Andy Warhol. Right: Cindy Sherman, Untitled #121, 1983. C-print; 40 x 27 1/2″. 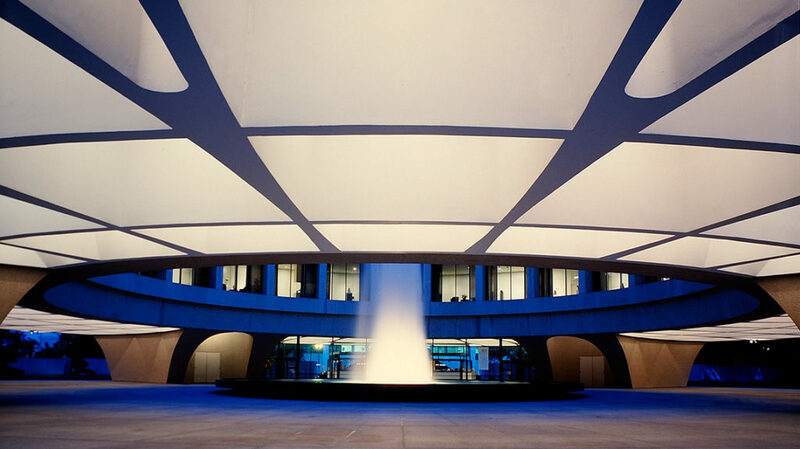 Hirshhorn Museum and Sculpture Garden, Smithsonian Institution, Washington, DC, Smithsonian Institution. Gift of Dr. William H. Goldiner, 1998. Photo by Lee Stalsworth. 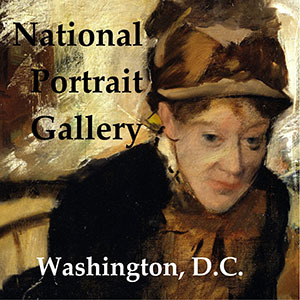 Numerous artists included in this show were part of the Pictures Generation, including Levine, Kruger, Sherman, Prince, Birnbaum, Charlesworth Lawler, McCollum and Welling. The Picture Generation, a loosely-known group of emerging artists working in photography, film, video, text art and performance were shown in an important exhibition at the Artist’s Space Gallery in New York in 1977. They brought to their work the self-reflexive and critical principles of Minimal and Conceptual art, togther with a social critique focusing on how images shape our perceptions of the world and ourselves. The focus of curator, Gianni Jetzer is on the imprinting of art and artists who adopted the methods of commercial advertising in the 1980s, hitherto without depth or bite. 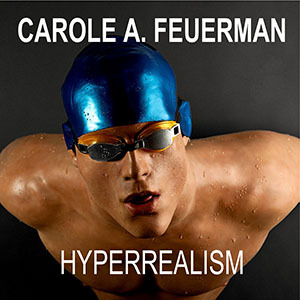 It touches on the impact of critical theory and how its ideas about society and coded representation influenced artists in a media flooded world yet doesn’t expand on this in depth. Each gallery is arranged by specific themes as From the Studio to the Office, Pictures and Promises, Self-Branding and concluding with the financial crash of 1987 and the AIDS crisis. Regrettably, the well-done wall-calls unveil the narrative more comprehensibly then nearly all of the art on view. 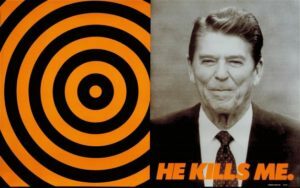 Nevertheless, artists including Donald Moffett’s with his portrayal of Ronald Regan with target symbol in He Kills Me, from 1987 (above, left) and Krzysztof Wodiczko’s Homeless Vehicle in New York City, 1988-89 hit the mark about the social strife of this era. Nonetheless, if a curator opts to go down this path in hope of demonstrating a new perspective about an era, it is essential to select stellar work and artists for such a display, as well as to create a meaningful context for viewers. “Brand New” is a laboriously weak exhibition filled with numerous secondary works. Firstly, it is too vast, with of numerous insignificant smaller pieces in each gallery. Secondly, there are key omissions in this show, including Andy Warhol’s Brillo Boxes and Campbell Soup cans (the artist who began exploiting branding and commodity in his art); Jasper Johns Ballantine Ale can (another key pop artist who used branding); and Keith Harring, master artist of graffiti and a major spokesman for the AIDS epidemic. Moreover, if one elects to focus on the AIDS crisis, where are the iconic photographs of Robert Mapplethorpe or Ross Bleckner, whose art has largely been an investigation of change, loss, and memory, often addressing the subject of AIDS? It was refreshing to see the work of Tishan Hsu, one of the most inventive artists of the 1980s, in the section labeled Hygiene and Contamination. Hsu’s ingenious art is a blending of the human body, mind and machine however, the piece on view Biocube, doesn’t have a commanding presence in the teeming gallery as perhaps Doublebind, 1989 or Security, 1989 might have had. Another significant artist is Ashley Bickerton, represented by his Tormented Self-Portrait (Susie at Arles) No. 2, 1987-88, is an unconventional graphic self- portrait, and one of the most appropriate works in the show. 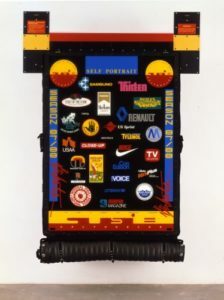 Comprised of numerous brand names logos that represent day-to-day consumer choices, Bickerton demonstrates his artistic individuality as a workout in branding, as he envisages himself as an accrual of products. Without a doubt, Jeff Koons is the poster boy of commodity in the 1980s. However, his representation in this exhibition is overkill. Additionally, if one is to include his mundane household cleaners, why not show New Hoover Quadraflex, four vacuum cleaners, instead of the limp New Hoover Deluxe Rug Shampooer, 1979? Since this show is examining the 80s, where is Koon’s’ Michael Jackson and Bubbles, 1988, which is a more appropriate piece then the endless array of his narcissist Ad Portfolio images? The inclusion of Sherrie Levine’s minuscule blue striped chair seat is both absurd and lackluster as is Ignatz, a crazed looking cartoon-like, arm-waving mouse standing on its hind legs. What is that about? Levine established herself as a significant artist of postmodernism with her facsimiles of noteworthy male artists’ work, including Walker Evans celebrated photographs and her replicas of modern painting by Kazimir Malevich, Piet Mondrian and Egon Schiele. Why aren’t any of these significant works on display? These are essential and demonstrate Levine’s critique of the patriarchy while expressing her concerns about the unrecognized position of women artists in the art world. Along the lines of appropriation, Cindy Sherman and Richard Prince sought to question the seductive and often oppressive influence of mass media over our individual and collective identities. In their examination of how images are culturally constructed, they succeeded in producing remarkable works, yet each artist is only represented here with a single, unexceptional work. Right: Left:Installation view of Brand New: Art and Commodity in the 1980s at the Hirshhorn Museum and Sculpture Garden, 2018. Photo: Cathy Carver. 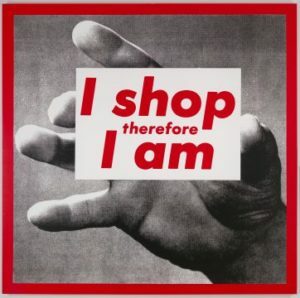 Barbara Kruger’s 1987 I Shop Therefore I Am (above, right), purports to be a cynical commentary on consumerism, however, by now, it has been reduced to a dull, familiar cliché. 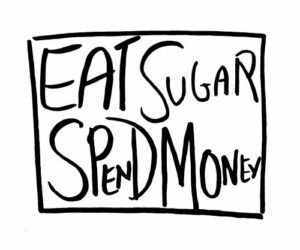 Her more biting pieces as Untitled (Your body is a battleground), 1989, or Untitled (Money Can Buy You Love), 1980, would have been more fitting. 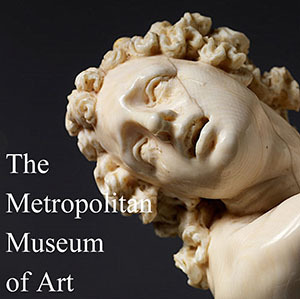 One could easily avoid this exhibition yet gain in-depth information about this curator’s intent, simply by reading the accompanying, excellent catalogue. A freelance art critic and curator living in Bethesda, MD who curated retrospectives of Mel Bochner, Barry Le Va and the drawings of Elizabeth Murray along with New Generations: Chicago & New York. She is the former Executive Director of the Contemporary Arts Center, Cincinnati and the Carnegie Mellon Art Gallery in Pittsburgh. [i] Steven Best and Douglas Kellner, The Postmodern Turn, Guilford Press, 1997. pp. 186. [ii] Elaine A. King: Many believe that the‘80s still matter since the seeds of what we’ve become and take as ‘normal’ were planted back then. Hip-hop broke into the mainstream in the ‘80s and, because of that, is now America’s primary pop-music language. During this period, contemporary art shifted from questionable outsider to trendy and acceptable, laying the foundation for the out of control art market with its influential wealthy, global collectors. 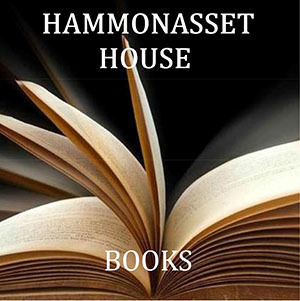 Yet during this time the cultural community was being overwhelmed by the spectre of the AIDS virus, crack epidemic and extensive crime rampant throughout the city.